What is gold bead therapy and how does it work? Gold beads are implanted into specific acupuncture points, which vary depending on the medical condition and the individual energetics of the animal by a qualified veterinarian and acupuncturist. This is a safe, drug-free, and effective way to help patients by providing a permanent form of acupuncture. The veterinarian must ensure the animal's health before the procedure. In particular, their liver, kidneys, and heart should be reasonably healthy to undergo anaesthesia, which we would check by means of a blood test. Although the procedure is short, anesthetizing the animals is necessary to ensure they're still for the surgery. An X-ray is taken before implantation to determine a diagnosis and bead positions. 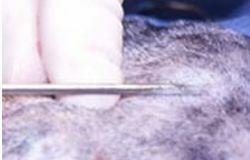 Shaving the hair over the implant sites and sterilizing the area prevents infection. 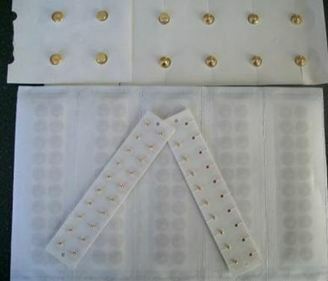 Beads remain for the life of the patient stimulating acupuncture points and meridians permanently. We recommend that the patient never undergoes an MRI scan as the magnetic beads may interfere with it. If the patient has multiple areas of musculo-skeletal disease, for instance, wobblers in the neck and spondylosis of the lumbar spine, then the procedure would treat both ailments. Although it's always better to treat a disease in its earliest state and no one can ever guarantee anything, even severely disabled animals can respond nicely to the procedure. We see an improvement sometimes the same day, and often have as high as a 75% success rate for improving the pet overall. Like other forms of holistic medicine, the beads will not harm the pet. 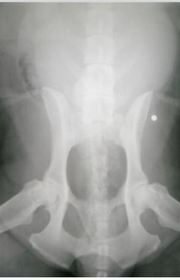 In some spondylosis cases and early Hip dysplasia cases I would say an almost complete absence of symptoms has been achieved. Did you know that the younger a dog is - the better the results? Some of my Hip Dysplasia patients had the GBI’s done at the age of 18 months to 2 years, and are still going strong without any signs of HD after 4-5 years. By now they would have been euthanased from lack of being able to control the pain. I have treated several Degenerative Disc Disease patients long after paresis or paralysis started and still had improvements which was most unexpected. 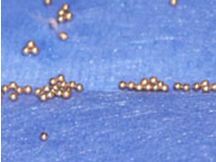 4) Gold molecule therapy (as they are gold plated) – it has been found that minute gold particles are released into the localised tissue which has a modulating effect on inflammatory cells and improves remodelling of bone structures, demineralisation of abnormal tissues and a long term normalisation effect. Dr. Durkes who revolutionised the procedure in the USA, theorizes that certain diseases are caused in part by a localized alkalosis, or a negative charge in body tissues. He speculates a negative charge to the tissue is caused by vaccines or diet. The beads appear to give off positive charges and can normalize dysplastic joints especially in young dogs. In intervertebral disc disease, wobblers disease and ventral bridging spondylosis, perhaps the ionic abnormalities cause oxidisation, and degeneration, resulting in destabilizing the vertebra within the spine. In wobblers disease, the bone inside of the vertebral canal gets thicker in a desperate effort for stabilization. This compresses the spinal cord. The beads help tighten surrounding ligaments and connective tissues to stabilize the neck. The patient may feel better soon after implantation, but improvement might occur over several more months because it takes time for calcium to be re-absorbed and pressure to be lifted from the spinal cord. Success depends on whether the body can repair damage from pinching the spinal cord. In the case of spinal spondylosis or ventral bridging of the vertebra, the body is also attempting to stabilize unstable vertebrae. The beads tighten the connective tissue and we believe they give off positive charges to normalize ionic changes in the tissue. The patient feels better soon after surgery, but the X-rays might not show improvement for at least six months. We try to focus on the patient, not the radiograph. In epileptic seizures the gold beads are correcting electrical blockages in the nervous system. These electrical blockages will eventually cause seizures if the body is unable to correct them. According to Terry Durkes D.V.M. approximately 60% of epileptic pets are cured. They no longer have seizures and will no longer need phenobarbitone. If they are on potassium bromide(KBr) they will have to continue its use though. Another 20% will no longer have seizures but they are required to take phenobarbitone at a reduced dose. The final 20% will continue to have seizures, in some cases fewer and less severe and some of course will not be helped at all. Below shows the size of the beads and magnets used, and although the beads are hard to see in this HD radiograph, the position of the magnet is easily visible. Disclaimer & Copyright notice This website is not intended to replace veterinary care or the need for a qualified animal behaviourist. All information is submitted by professionals however Friends of the Dog may not necessarily agree with all content.All articles are copyrighted and may not be reproduced without the express and written permission of the authors. Keeping senior dogs active physically and involved mentally can help to extend their lives. 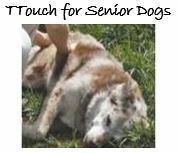 The Tellington TTouch Method is an ideal complement of supportive care for active and not-so-active senior dogs. You find a Medical Ins that suits you and your dog better - can you change it and how easy is it to do so?